“Probe must be done on the missing millions in the North West” - SABC News - Breaking news, special reports, world, business, sport coverage of all South African current events. Africa's news leader. 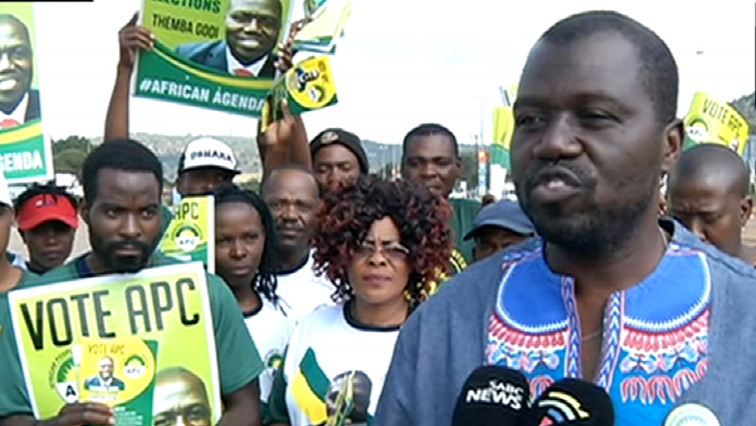 Godi took his party's election campaign to Rustenburg. The leader of the African People’s Convention (APC), Themba Godi, says a probe must be done on the missing millions belonging to mineral rich communities in the North West. Godi took his party’s election campaign to Rustenburg. He claims millions of rands went missing from the D-account administered by the provincial government. “An APC government will ensure first and foremost that there is accountability for all the monies deposited into the d-account that have not been accounted for, for so many years. Secondly, we’ll ensure that mining companies conform to their licence conditions in terms of ensuring that the communities that live around the mines benefit,” says Godi. Supporters cite Godi’s work at parliament’s standing committee on public accounts (Scopa) as a reason for South Africans to vote for APC. “We all know how strict and an honest leader he is Themba Godi. We do ask South Africans to give him a chance to be a leader,” says a supporter. “My president Themba Godi, I love him, and I trust him, because for 14 years, he’s been in Scopa. He has never been mentioned in any corruptions,” adds another supporter. “The reason why I should vote for it is because from the look of things, it would make a provision for what we have been shorting or lacking,” says another supporter. Godi says the North West government is synonymous with corruption; a matter his administration would not hesitate to out root.